If you require a third-party to carry out work on a letting property you can complete a Work Order which, when combined with BDP Command, will send emails, SMS and/or documents to all parties with instructions and advice about when, where and what will be carried out. In the left hand tools menu click “New work order”. Assign the work order to a BDP user as required. Fill in the name and details of the contractor who will be carrying out the work. If you are using BDP Command to create a work order document and send an email or SMS to the contractor, be sure to fill in the email and telephone fields accurately. 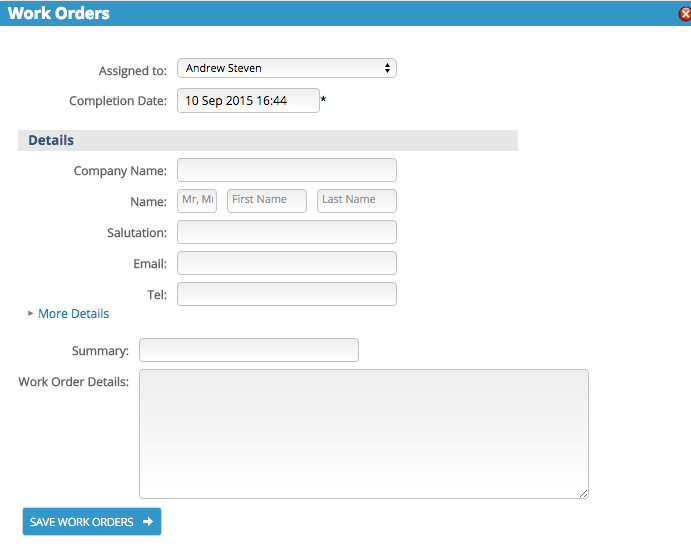 Complete the Summary and Work Order Details fields as required. The Work Orders widget contains a list of past and current work orders. From this widget you can send an email directly to the contractor, you can edit the work order and you can link to the contractor’s contact card in the BDP contact database. If you no longer wish to see the work order in the list you can click the icon to hide it.